A DAR is a private individual who has been designated by the Federal Aviation Administration with the authority to perform certain functions on behalf of the FAA. A DAR is responsible for upholding the FAA’s standards. A DAR is under no obligation to certify anything that does not meet the requirements of the appropriate Federal Aviation Regulations (FARs). By contracting a DAR, the client establishes the time and place of the inspection and frees the client from being at the mercy or time constraints of the regular FAA office. The functional roles and responsibilities for DARs are set forth in FAA Order 8130.2F. FAA Designated Airworthiness Representative (DAR) services help you meet your needs when you need a liaison with the FAA. If you have many aircraft in your area that need to be inspected there may be the availability of traveling to your area for inspections to take place. Call with inquiries and fees. We will assist you in filling out your paperwork accurately so to help eliminate delays and re-submissions. All scheduling will be done through Rainbow Aviation. If you need assistance in acquiring or filing paperwork, getting your planes ready, etc. Please feel free to contact Carol Carpenter @ Rainbow Aviation 530-567-5141 0r email Info@rainbowaviation.com. Rainbow Aviation staff members can also assist you in determining whether your aircraft will make the grade! If you attempt an inspection and your aircraft does not pass you will need to reschedule for an additional inspection costing additional time and money. 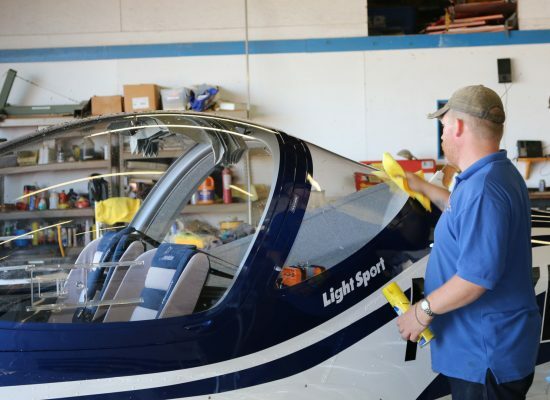 Rainbow Aviation is dedicated to assisting any individual, group or manufacturer in working their way up the Sport Pilot/Light Sport Aircraft Ladder. In addition to being a DAR, Brian Carpenter was selected as one of only eight Candidates to attend the first FAA Sport Pilot Examiner course given January 17-22, 2005. He has a long and illustrious background with certified, experimental, and ultralight aircraft. He has been an A/P IA mechanic with an inspection authorization for over 25 years, is a commercial pilot, and certificated flight instructor with an instrument rating. He has built and flown over forty experimental and ultralight aircraft. He has designed and built several original design aircraft including the EMG-6 Electric Motor Glider. As the founder of Rainbow Aviation he has dedicated his career to helping the aviation community thrive and grow through safety and excellence. His experience includes acting as an FAA Aviation Safety Counselor, EAA Technical Counselor, and EAA Flight Advisor. Brian is also the co-author of A Professional Approach to Ultralights and Sport Pilot Airplane, A Complete Guide. And the 2017 GAA AMT of the Year. To register your plane in the amateur-built or Light Sport experimental category, first, contact a DAR. 8050-1 – Aircraft Registration Application. (This form not available online. Only an original form will be accepted. To request a copy of this form, contact your local FSDO). (Optional) Custom N-Number request, if you want to request that a specific N-number be assigned to your plane, and you did not previously reserve it online. (See Appendix 11 of 20-27F for an example). When the registration has been approved, the FAA will send you a 8050-3 (Certificate Of Aircraft Registration). Label fuel system, to show what fuel is required, and the tank(s) capacity. There should be a way to determine fuel on board (fuel gauge installed, or tank is marked in gallons). Have all your builder logs, engine log, prop log, POH, all manuals and certs for your equipment installed. Any inspection sheets from your Tech Counselor. Have your flight testing plan made out and available. Have all the removable inspection covers off, cowl off, seats out, carpet out, covers off, basically everything off and open like an annual inspection. Neatly display all the items removed. Have the plane and surrounding area as neat and tidy as possible. You should have gotten an amateur built package from the FAA. This will be helpful in getting everything ready.